The mountains of Afghanistan are not exactly equipped with state of the art plumbing, so a cold shower to escape the dirt, grime, and oppressive heat was never an option. Such was the inspiration behind Cold Shower Cooling Field Towels. 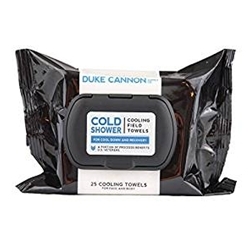 Developed in concert with our military advisory panel, these face and body towels are manufactured with menthol, aloe, and jojoba to provide a chilling blast as they cleanse and protect. The perfect way to cool down and recover after 12-hour shifts, covert field missions, or back alley boxing matches.